Recently the diving industry lost Dr. R.W. ‘Bill’ Hamilton (1930-2011), whose intellect, compassion and love of life, will not soon be forgotten. Rarely in life do we encounter someone who was as impressive yet unassuming, humble, and gracious as R.W. ‘Bill’ Hamilton, Ph.D. On September 16, 2011, Bill died surrounded by his family and close friends. Within hours, e-mails and telephone calls reached thousands of people and the news of his passing went viral. Nearly four hundred scurried to make plans to attend his memorial service. So what made this particular man so special? Born in Midland, Texas, Bill would always explore things on the edge of the envelope. He first expanded his youthful mind with liberal arts at the University of Texas, then went on to earn a master’s degree in animal breeding at Texas A&M. He finished up his formal education by earning his doctorate degree in physiology and biophysics at the University of Minnesota. Along the way Dr. Bill joined the U.S. Air Force, earning the rank of Major and serving as a jet fighter pilot during the Korean War and again in Vietnam, where he earned the Distinguished Flying Cross, Air Medal, and other decorations. As a Life Support Officer he helped solve equipment problems on unsuccessful bailouts, which earned him a National Academy of Sciences recommendation to NASA as a Scientist Astronaut. Eventually, Bill left the Air Force with his wife and four children and headed to Buffalo, New York, in 1964, where he met Heinz Schreiner and began his work in the undersea world. The 1960s was a decade of change and exploration – some with art, music, politics and war protests – but for Dr. Bill, it was working as a scientist and director of a leading environmental physiology and diving research lab called Ocean Systems (a division of Union Carbide) based in Tarrytown, NY. Dr. Hamilton and his staff conducted extensive research on the effects of gases both under increased pressure and in hypobaric environments. This work led to the development of decompression modeling tools and operational procedures for divers, astronauts, hyperbaric chambers, and tunnel and caisson workers. 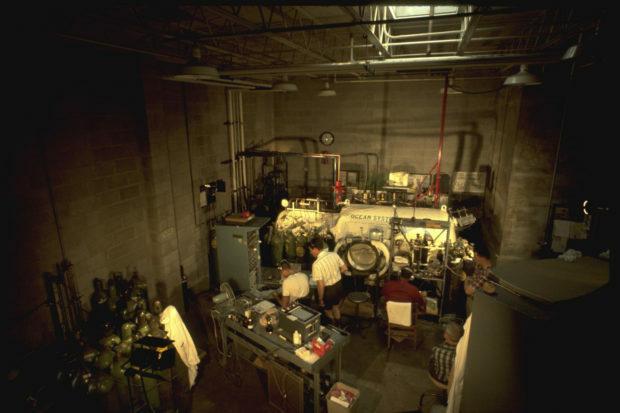 One of the early projects, in which Dr. Bill was both the physiologist and test subject, led in 1965 to the first manned laboratory saturation ‘dive’ to the continental shelf pressure of 656 feet, 12 atmospheres (200m) of sea water. All of this was just the beginning. During his time at Ocean Systems, and after the death of his first wife Beverly in 1970, Dr. Bill met Kathryn Faulkner (aka ‘Ruby Lips’) on an Eastern Airlines Shuttle. That chance meeting turned into a 40-year marriage that has created an international family of friends and colleagues. Ruby played a pivotal role in Dr. Bill’s life, becoming a mother to his children and then grandmother to their children. Not satisfied to simply play a side role, however, Ruby also managed the business aspects of Hamilton Research, including finance, contracts, calendar, travel, and social events, and served as Bill’s sounding board for difficult decisions. It was rare Dr. Bill would be at an event without her close by. By 1976, Dr. Hamilton took one of the biggest risks an academic could ever take: he set out to create his own physiology consulting firm – Hamilton Research, Ltd. Tucked away in a room in his house overlooking the Hudson River, Hamilton Research became the premier organization for decompression and hyperbaric research. Dr. Bill was often sought for consultation and collaboration. He worked extensively with oil companies, the military, and others in developing procedures and techniques to mitigate the effects of High Pressure Neurological Syndrome (HPNS) while compressing to depths of 984 to 1,969 feet (300-600m). The big project from Hamilton Research that has had an inestimable impact on decompression research was the development of the Diving Computational Analysis Program (DCAP). DCAP was co-developed with David J. Kenyon, and is a comprehensive computer program that could analyze and develop decompression procedures and schedules for a wide variety of exposures to pressure, including submarine escape, space travel, deep commercial diving, caisson and tunnel work, and free-swimming technical diving. The program did nothing short of revolutionize decompression analysis. Hamilton Research, armed with DCAP, began working with British, Swedish, Japanese, Finnish, Israeli, Italian and U.S. navies; Canadian and German research centers; the Norwegian Underwater Institute, and countless other organizations around the world. In addition to DCAP, Dr. Bill also was the principal investigator and scientist in the creation of the NOAA Repex Oxygen Exposure tables – the basis for most every oxygen exposure calculation method used today for saturation and repetitive exposures to oxygen in breathing mixtures. His work continued to evolve and was consulted by attorneys and diving equipment companies on topics including dive computers, rebreathers, and expert witness testimony. He was even consulted by food companies on packaging foods in pressurized environments. His reach was endless. In the late 1980s, his love for the edge of the envelope was directed toward extreme recreational divers. For decades, only commercial and military divers had access to mixed gases for diving operations. But now cave divers and wreck divers wanted to go deeper and farther than air would allow them to go safely. In an unprecedented move, Dr. Bill stepped out of his traditional role with commercial and military clients and stepped into the world of sport divers. He created a custom set of decompression tables for extreme cave dives into Florida’s Wakulla system. These were dives to 328 feet (100m) on open circuit SCUBA with managed oxygen exposures and minimal nitrogen narcosis. The project was a success and now the ‘underground’ was abuzz. While some of his colleagues criticized him for these efforts, Dr. Bill believed that if he did not help these divers they would do the dives anyway and possibly get hurt. His humanity was exemplified in his desire to help them and, as such, he opened up a whole new world of underwater exploration by the free-swimming untethered diver. This was the birth of ‘technical diving.’ News of Dr. Hamilton’s tables got out and practicing deep divers from all over the world began contacting him for help. Along came Captain Billy Deans from Key West, who had been doing deep dives for years but wanted a better and safer way to do it. He and Dr. Bill became fast friends and Dr. Bill helped Billy to create the first training program for open-ocean trimix diving. The friendship played a role in the creation of the Key West Consortium—a group of divers who hired Hamilton Research, Ltd., to create a universal set of trimix decompression tables for use during open-ocean dives ranging between 180 and 250 fsw (55-76m). This opened up access to deeper wrecks the world over. The success of these tables after thousands and thousands of dives, led Dr. Hamilton to create trimix tables for NOAA for use on the USS Monitor research projects. He was also a key contributor and advisor to aquaCORPS Journal, beginning with his seminal article, Call It High-Tech Diving, in the first issue in January, 1990, which sought to explain the technological changes taking place in sport diving. This second part of an already accomplished career was shining bright. Dr. Bill was on everyone’s invite list for conferences and workshops around the globe. He was a principal contributor to the 1992 aquaCORPS Nitrox Workshop in Houston that helped make nitrox diving mainstream in the recreational diving world. Dr. Bill then went on to write nitrox training manuals and programs for many of the certification agencies and was a major contributor to the original NOAA Diving Manual for air, nitrox, and mixed gasses. He worked with many manufacturers on their dive computers and algorithms and was a regular consultant to the U.S. Navy on matters of decompression and decompression illness treatment. Dr. Bill was generous with his time and advice, and he served by volunteering wherever he could. Often times, this meant repairing anything, from lights in his church, to sitting on boards for the Divers Alert Network (DAN), the Undersea and Hyperbaric Medical Society (UHMS), the National Oceanic and Atmospheric Administration (NOAA), and the National Fire Protection Association (NFPA). Dr. Bill volunteered to lead conferences as a keynote speaker, and to serve in the Air National Guard. He was never more than a phone call or e-mail away to help those in need. That was his nature. Over the years Dr. Bill was recipient of more than a hundred honors and awards from most every diving and science organization. From keynote speaker to Diver of the Year someplace in the world, he and Ruby Lips would often be featured at the party. And then, Dr. Bill would slip off for a little nap, then find a laptop or cocktail napkin, and have serious discussions with serious people about things that mattered, like life support. Dr. Hamilton’s accomplishments in life go deeper than the bottom of the sea and higher than Mount Everest. They delve into the hearts and minds of friends, family, and colleagues. He instilled the desire in each of us who knew him to be better at what we do. His contributions to the world of diving are unmatched, and his forward thinking of how divers would survive underwater is arguably the basis for all extreme exposure diving today. His modus operandi was to get the job done right and then have a good time with the people around him. Everybody he met, if only for a moment, was a better person for it. Dr. Bill’s ability to examine and explore ways to make something or someone better was his way. A little nap here and there and he was recharged and ready to take on the next task. Dr. Bill Hamilton was predeceased by his wife, Beverly; son, Beto; and daughter, Kitty. He is survived by his wife of nearly 40 years, Kathryn ‘Ruby Lips’, daughters Lucy and Sally, sisters Emily and Ann, grandsons, Felix, Bobby, Zach, Tyler, and Truman, and an untold number of adoring and loving fans. He is already missed. It’s 1966 in Buffalo, New York, and I’m inside a steel-walled chamber at the Ocean Systems research facility—decompressing from a dive to 650 feet (200m). I have a fierce pain in both knees and it’s growing into a fire that makes me dizzy. Something’s gone terribly wrong with our experimental decompression schedule and tiny oxy-helium bubbles are turning sharp knives inside my body. I notice a handsome, reassuring face in the viewport talking to me on the intercom: “Don’t worry Doc, we’ll recompress you to a depth that will compress the bubbles. Then we’ll reconfigure the decompression schedule to bring you up safely.” It Is my brother-in-science Bill Hamilton—jet fighter pilot and diving physiologist, a man as comfortable flying at the speed of sound as he Is measuring the respiration of divers breathing helium deep beneath the ocean. Bill was one of those daring men who explored the physiological limits of the human body. He had a unique way of choreographing scientific data and the facts within the data and the relevance of the facts—weaving everything together into an observation or report that enhanced the health and safety of working divers at extreme depths. Bill, his partners, and a room-sized IBM 360 computer quickly came up with a recompression-decompression profile that allowed me to stumble out of the chamber 10 hours later with knees bruised but intact. That night we took the team to a five-star restaurant in Niagara Falls and went mano-a-mano with three bottles of rum. Honest, humorous and courageous, Bill Hamilton was someone you could count on when water was pouring into the ship. Bill did not just mentor me, he forever changed my future – and in many ways saved my life by pushing me to be exceptional by his example. He saved me from accepting my present, and dreaming my future into reality. We enjoyed 40 years of doing the impossible together, all with lots of love and good laughs. Dr. Hamilton’s contributions to the world of diving were immeasurable. We are eternally grateful that he devoted his life to keeping others alive while they were visiting alien environments. His generosity of spirit is unmatched in our fields. Bill contributed so much to the world of diving: his proprietary DCAP decompression tables, the concept of Oxygen Tolerance Units, research and insights into various aspects of hypobaric and hyperbaric physiology… to name a few. He was a humble guy who always enjoyed sharing his love of, and curiosity about, life, including his cooking, his gardening, his favorite mixed drink recipes, and various insights into the world. Dr. Hamilton was a major motivator in my career as well as one of the earliest supporters of Rubicon. He was always checking in to see what else he could help me find or to make sure I knew who to talk to about permission for rare documents. Though most sport divers today have probably never heard of him, Dr. Bill Hamilton‚s involvement was critical to the development of tech diving, and the adoption of mix technology by the sport diving community. His contribution was much more than just providing decompression tables. Rather, Dr. Bill provided the knowledge, needed experience and judgement that helped nourish and guide the emerging tech community.